With Phoenix hosting the Super Bowl, many new and returning visitors will descend on the Valley of the Sun come February 1. We're happy to welcome Seattle and New England football fans to enjoy our warm, sunny winter weather and experience the metro Phoenix area like a true Localist! While you're here, don't miss some of these fun events that will really showcase all that Phoenix has to offer! See below for details. 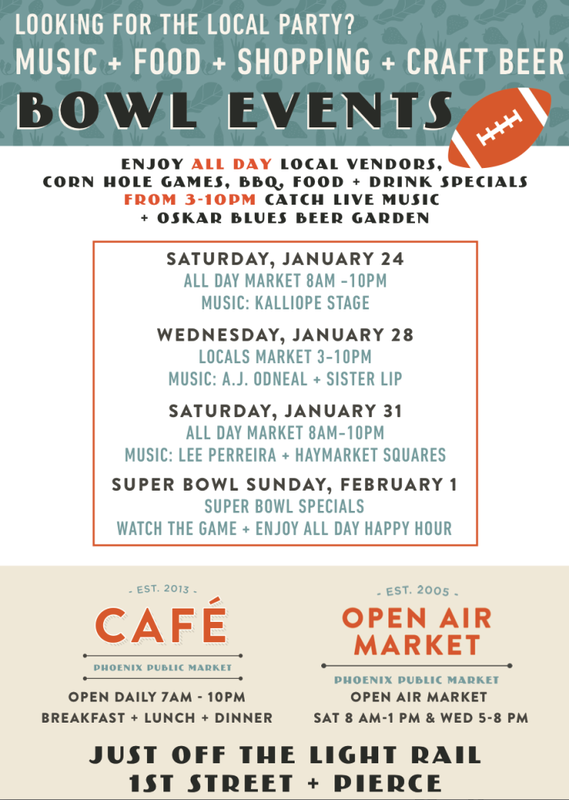 Phoenix Public Market Super Bowl Plans January 24 from 8am to 10pm, January 28 from 3pm to 10pm, January 31st from 8am to 10pm, and February 1st All Day 721 North Central Avenue, Phoenix Mid-week, on Jan 28th, stock up on local snacks at the Open Air Market for extended hours from 3pm to 10pm, accompanied by A.J. ODneal and Sister Lip and the Oksar Blues Beer Garden. On both Saturdays Jan 24th and Jan 31st, join in the Phoenix Public Market Bowl Events with an open air market showcasing 100+ of Downtown Phoenix's best local vendors, BBQ, and food + drink specials from 8am-10pm. Starting at 3pm, you can cruise through the Oksar Blues Beer Garden while Kalliope Stage (January 24th) or Lee Perreira and Haymarket Squares (January 31st) take the stage to celebrate our city's Superbowl. During the game, on Feb 1st, rally in the Public Market Café to watch the game with food specials and all day happy hour. Roosevelt Row Sidewalk Sale January 23-25 & January 30 - Feb 1 from 10AM - 5PM Roosevelt Row, Phoenix Sample Roosevelt businesses with a outside sidewalk sale, along 1st streets - 6th streets and on Roosevelt focusing on unique gifts, art pieces, vintage wear and more during the weekends of Probowl and Superbowl this month! Explore the walk-able areas of the Roosevelt Row arts district and stop for a bit at any participating Roosevelt Row restaurant for a $5 taste of signature food or drink from their menu. You're Invited to Arizona's Outdoor Recreation Headquarters Now through February 1st Downtown Phoenix Arizona State Parks' offices at 1300 W. Washington St. in Phoenix are your "Outdoor Headquarters" during the big week. Visitors to Arizona and family members are encouraged to stop by and pick up a bag of brochures, maps and information about all the facilities where you can go for hiking, biking, sightseeing, horseback riding, fishing, picnicking or boating while you are in Arizona. State Parks have more than 1,000 campsites so whether you are a tent camper, RV camper or need a nice cozy camping cabin, our customer service representatives will help visitors find the best place to hike or camp and give visitors all kinds of maps and materials. Fair Trade Café Superbowl Celebration January 28 to January 31st from 7pm to 11pm and Febuary 1st starting at 10am Fair Trade Café and Community Kitchen, Phoenix Hosted by It's All About Love and starting Wednesday night, Jan 28th, there will be live DJs, bands, dancers, artists, food trucks and vendors from all over Phoenix entertaining at The Fair Trade Community Kitchen. The line up includes Wednesday with Real Radio Mix Show & Intoxicated Art on the patio, Thursday with Kim E Fresh and exclusive menu & drink specials, Friday is a cocktail party featuring live music from Jon White and DJ TooFine!, and Saturday features DjOne Period & DJ DN³ on the patio with football inspired signature drinks. On game day, grab coffee and a bite at The Fair Trade Café starting at 10am for the Pre-Game Brunch. Super Bowl Super Meal Sunday, February 1st starting at 4pm. Pizza People Pub 1326 North Central Avenue, Phoenix Starting at 4pm on gameday, pull up a seat at Pizza People Pub to enjoy a cheese pizza, large mac'n'cheese, hot wings, and a 32 oz. pitcher of beer or soda or a house wine carafe all for $30.00! To make it even tastier, if you bring in two canned or boxed food items to donate to St. Mary's Food Bank you will be entered in their halftime raffle. For full info click here! Gertrude’s and San Tan Brewery Local Craft Beer Dinner Wednesday, January 28 at 6 p.m. Gerturude's at The Phoenix Botanical Garden 1201 North Galvin Parkway, Phoenix Gertrude's and San Tan Brewing Company have teamed up to celebrate the Big Game Week with a local craft beer dinner. Enjoy six courses paired with a specialty San Tan brew. Reservations required, with full information here. The Superb Owl Shuffle 5k Sunday, February 1, 2015 at 9:00am Kiwanis Park 5500 South Mill Avenue, Tempe Before kickoff at 4:30pm MST, get moving with the The Superb Owl Shuffle 5k run/walk, 100 Yard Kids' Blitz, and Fun Run in Kiwanis Park put on by The Night Run Inc DBA Superb Owl Productions. The course is mostly lake-side and the event is kid friendly! Full registration information available here! Four Peaks Kegerator Raffle Drawing Febuary 1st Four Peaks Brewery, Tempe or Scottsdale If you stop by either Four Peaks location before January 31st to purchase a $5 raffle ticket for a chance to win a Four Peaks Kegerator. They will be watching the game and drawing the winning ticket on Super Bowl Sunday! All ticket proceeds go to the St. Mary's Food Bank Alliance. Upward Restaurants Catering Phoenix Metro Area for Superbowl Week The Upward Restaurant group is offering catering specials for your Superbowl party. The restaurants include Windsor, Churn, Postino Winecafe, Joyride Taco House, and Federal Pizza. Contact any specific restaurant for more information! Big Game Programs at Pueblo Grande Museum January 29-Feb 1 Phoenix Buff up on your historical game knowledge in preparation for the Big Game by visiting the Pueblo Grande Museum on Thursday Jan 29 at 10am for a Prehistoric Games Drop-in Program to learn about some of the ancient games of the Southwest. Even get a first-hand experience of playing them! On Jan 30th at noon join David R. Wilcox for his Brown Bad Ball-court Lecture about various Native American southwestern games. The BIG GAME ArtWalk at On The Edge January 31st Scottsdale, AZ Game on at On the Edge Gallery! One of the most exciting events of 2015 is in town, and On The Edge Gallery is part of the lineup with The BIG GAME ArtWalk at On The Edge. The afternoon’s game plan includes demonstrating artists, exciting artwork, BIG GAME refreshments, and a $50 gift certificate raffle! On The Edge’s playbook for that day also includes a tailgate sidewalk sale special promotion — with a $30 gallery purchase, you can rush down the field with a license plate frame uniquely created by On The Edge Artists! More information on their website here.